Ryerson wants to know where you stand on the school’s email systems. A consultation is currently underway to decide the fate of RMail, Ryerson’s proprietary in-house email service. RMail’s usage has been declining since 2012, when, after a year-long consultation, an advisory committee recommended the school use Google applications, known as G Suite for Education, including Gmail. Currently, users must opt in to Gmail when they set up a new account at the school, with an average of 93 per cent choosing to do so, says Brian Lesser, chief information officer at Computing and Communications Services (CCS). The main issue with RMail, Lesser says, is security. Google is simply better at filtering out phishing and malware attacks than Ryerson is. On top of that, there isn’t currently a two-factor identification system for RMail like there is for G Suite. 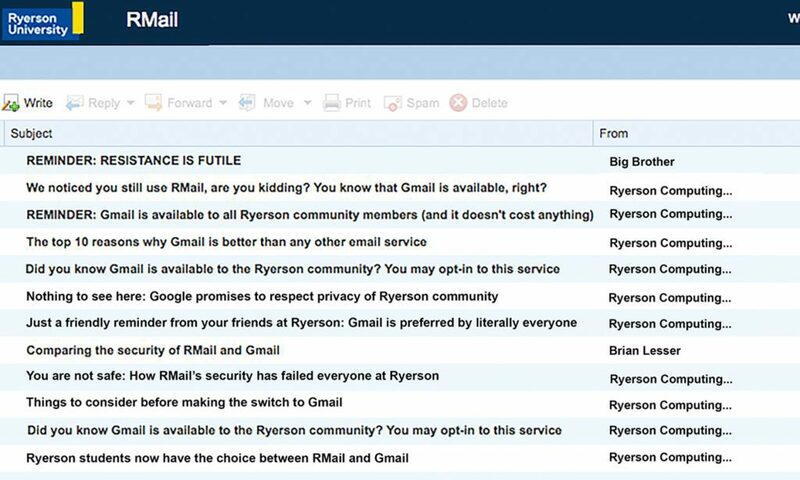 Despite having better security and a lower cost, some people are against making Gmail mandatory for the Ryerson community. With RMail, emails are hosted in Canada and under Canadian law. But because Google is an American company, it’s subject to different regulations. Blaise Alleyne, a tech consultant and web developer who’s currently taking non-profit management classes at the Chang School, said he was happy that Ryerson offers its own email service. He said he’s spent years trying to replace Google’s services with other options. When it comes to Google, Alleyne says his concerns are around privacy, tracking and the monopoly the tech giant has on the industry. Every month, 1.4 billion people use Gmail – including 80 million students – and that, Alleyne says, makes him feel like he has no say in how the product is administered. A cursory search of the internet, probably through Google, yields countless articles on our ever-dwindling privacy, and concerns levied against the company. Results vary from app developers reportedly reading your emails, to breaking promises on patient health data, to Toronto’s own controversial plan with Google’s Sidewalk Labs to create a smart city. Just last month, Ann Cavoukian, a distinguished expert-in-residence at Ryerson and Ontario’s former privacy commissioner, resigned from her role as advisor to Sidewalk Labs over privacy concerns. The number of hijacked accounts at Ryerson peaked in 2014, with 1170 incidents, according to CCS data provided to the Ryersonian. Last year, there were 82, but a further 116 accounts were locked because the passwords used for Ryerson accounts matched some compromised in a Yahoo security breach. Lesser says these numbers might not be completely accurate because not everyone reports incidents to CCS. The numbers also include some accounts that were registered as compromised when they actually weren’t. When an account is hijacked, someone from outside the university may have access to that account and other sensitive information associated with it. Lesser says he recognizes that some people simply don’t trust Google. But, he says, Google doesn’t track Ryerson users, nor does it read their emails or show ads. There’s a difference between an average consumer Gmail account and what Ryerson has set up through G Suite. Generally, less is shared through a G Suite Gmail account and what is shared can mostly be controlled by the university, according to the G Suite privacy notice. For example, a screenshot posted by Lesser on the consultation blog shows that tracking history and activity is turned off for the school. Information can be shared with consent from the user or administrator for legal reasons, such as a request from a government, to address fraud, or to protect Google. 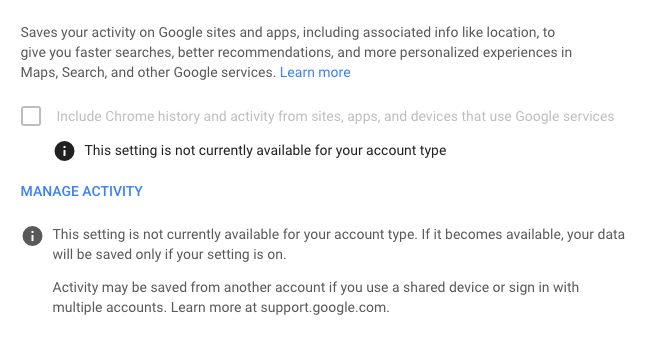 Information can also be shared for external processing, where Google will share data with “affiliates or other trusted businesses or persons,” the notice reads. Alleyne says that, rather than making Gmail mandatory, Ryerson should be using its computer science and engineering students to work on ways to improve RMail. Lesser says there’s a lot to consider and the process will take time. He said he expects there to be some public town halls in 2019 and says no changes will be made until after the spring semester.